What is PoPo Quick Swap System? PoPo stands for Pop On Pop Off. 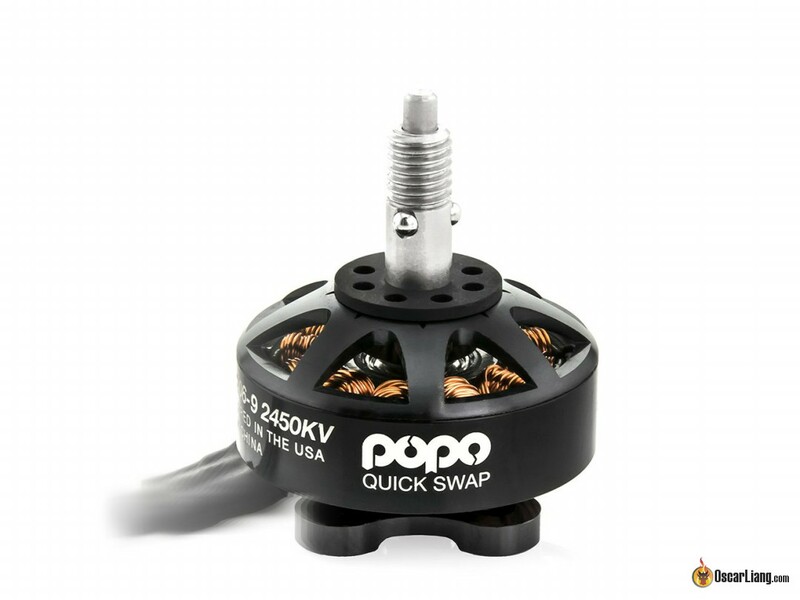 The PoPo Quick Swap System is a motor shaft design that aims to make changing out propellers faster and more efficient. It eliminates the need for prop nut and wrench to attach or remove propellers on a motor. There is a button on top of the motor shaft, press it and the propeller comes right off. As you can see there are some little spring loaded ball bearings on the shaft, which push in whenever you push the button down. It requires specifically made propellers to work with these shafts (aka PoPo Compatible props). These propellers have ball-shaped indentation inside the hub that fit into the bearings on the shaft. When you put the prop over the shaft the spring bearings just lock into place. The “quick release” mechanism is built inside a 5mm threaded shaft, and therefore its motors and propellers are all backward compatible with normal propellers and motors.